While these articles have revealed concerning issues, one could argue that workplace wellness is a business-to-business venture, with contracts entered voluntarily. Therefore, it is the responsibility of individual corporations and their consultants to identify and prevent questionable business practices and vendor claims, as long as employees themselves aren’t being harmed. However, it appears that the industry has now crossed a bright line, as the program chosen as the industry’s best—winning a C. Everett Koop Award from industry peers—did indeed harm employees, as is shown below and as was reported, and unrebutted, in STAT. This result, in any program—but especially the alleged best—should raise red flags for customers and regulators. First, we will show how Boise's employees became unhealthier both objectively, according to the trend of the biometrics, and subjectively, according to self-rated health status. Then, we will explore the specific aspects of the Wellsteps intervention that could have caused this outcome. 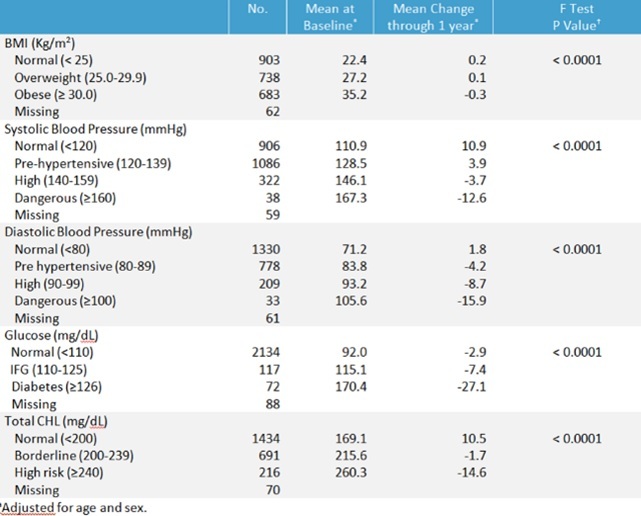 However, in this case, totaling the “mean change through 1 year” figures below shows that the former swamped the latter: 5293 biometric mean readings improved, while 6397 deteriorated. As was the case with McKesson and is the industry standard measurement technique, dropouts and non-participants are not counted or acknowledged in any other way. Could the Wellsteps Program Caused Boise Employees to Become Unhealthier? It may be that the Boise employees would have become unhealthier anyway, and that, like the McKesson program, the Wellsteps program made no difference. This conclusion is belied not only by the amount of causality claimed in its report, but also by a few specific undertakings that are known or widely believed to cause health to deteriorate. Second, in addition to the general overscreening creating this tendency, a specific example of the “nocebo effect” from this program would be moralizing about alcohol consumption in any quantity. In the chart above, note the average self-reported consumption of alcohol is 1.1 to 1.3 ounces per day, well below the 15 ounces/week considered problematic. However, Wellsteps calls any consumption of alcohol a “high level” and a “worst health behavior.” As noted in the chart below, everyone admitting to any amount of alcohol consumption (meaning the same group as in the chart above) is found to have this worst health behavior. 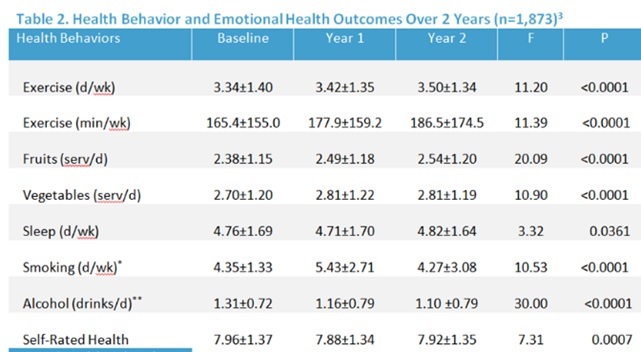 Third, paying people to change behaviors (or in the case of self-reported health habits, paying people to say they changed behaviors) is very controversial and may be counterproductive. It is also possible that the incentive-based program design itself created iatrogenic consequences due to the very high ($830) incentive payments. 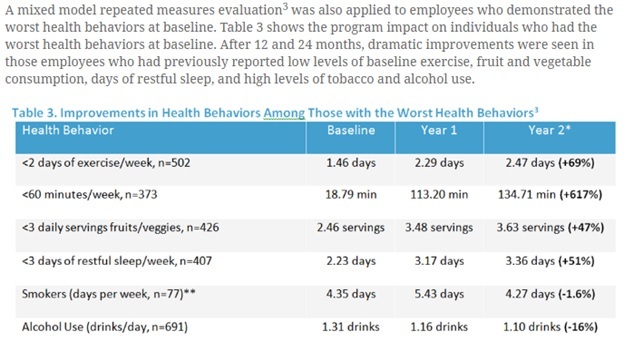 Between the overscreening, misunderstanding of the risks of alcohol, use of powerful but possibly counterproductive incentives, and Wellsteps’ own claims of causation, it is possible, if not likely, that the program caused the deterioration in health. Even if it didn’t and this was just pure coincidence, no program should be given an award for this performance, and no vendor should be allowed to claim it improved outcomes, based on this performance. Wellsteps’ award application revealed other issues as well. Examples would include misattribution of savings to the program and mathematically incompatible savings figures. Wellsteps’ CEO, Steve Aldana, and the head of the Koop Award Committee, Ron Goetzel, also appear to contradict themselves, and or admit error, in attempting to defend this program. While these flaws don’t involve the specific question of harms to employees addressed in this posting, they do further confirm that this industry needs to address major issues of credibility, mathematical competence, and cost-effectiveness, as Slate quite dramatically posited. While the Hippocratic oath calls for doctors to “do no harm,” an excellent argument may be made that the standard for wellness programs should be much higher due to the financial coercion that organizations use to drive employee engagement. Specifically, virtually everything else in ambulatory healthcare requires “opting in” to actively seek medical assistance. By contrast, wellness requires employees to “opt out” in order to avoid a clinical intervention. In the Boise example, opting out costs $830 in higher deductibles and contribution. To put this in perspective, other specific health-related activities for which people are or can be penalized for “opting out” include: wearing helmets/life jackets/seat belts and getting kids vaccinated. In each case, the clinical evidence/science allows government paternalism to overwhelm considerations of personal choice. Wellness, as the Wellsteps example shows, does not remotely approach the level of evidentiary certainty of these other de facto personal health requirements. Safety requirements have worked, reducing on-the-job fatalities by about two-thirds. There is overwhelming evidence that wellness has not produced measurable savings to date, and even acknowledgement by industry leaders that—to quote STAT—“vanishingly few” programs work. This Code could be the basis for a regulation. It might be too politically difficult to require wellness vendors to adhere to guidelines, owing to the support for wellness by politically powerful entities such as the Business Roundtable. Instead, a requirement of disclosure might be sufficient. So perhaps vendors should be required to either adhere to this or a similar “do no harm” standard, or else explain to employees why they aren’t adhering to it—and get releases from the employees saying they understand the risks of overscreening but would like to participate in wellness anyway. If they decline, they would be offered a “reasonable alternative” to the wellness program, such as healthcare education or an exercise program. While there is no guarantee the alternatives would save money or generate a positive impact on health, the likelihood that exercise or education would harm employees is far lower than the demonstrated chance of overscreeninng, moralizing, or large financial penalties would do exactly that.